What a beautiful door! It's sturdy too. The heavy glass opens smoothly and easily on the rollers, which add a distinctive design element as well. The doors in the photo are the brushed stainless steel finish, which looks very similar to the brushed nickel of the grab bars, towel racks, etcetera. Unless you know, you'd never know just by looking, so the stainless steel finish works well with brushed nickel. The door is VERY heavy - it was a struggle for even two people to lift - but that's what makes it so sturdy. The only way the door could be better would be if it were a "bypass" door - that is, both glass panes slide open. I would definitely recommend this door. With its classic roller sliding door and sleek modern design, the VIGO Elan Frameless Sliding Shower Door provides the ultimate in contemporary design for your bathroom. This shower door is crafted with quality tempered glass and 304-series stainless steel hardware and features an eye-catching round roller disk sliding system and sleek door handle. For a custom look, this door can be installed to slide open left or right. Fits shower opening widths: 56" - 60"
Door opening width: 25 1/2"
Dimensions 60.0 In. X 25.5 In. X 74.0 In. Saw this door at a local shower door emporium for $4600.00. So happy to find it on Overstock. Installed by contractor who renovated my bathroom. Ultra modern, streamlined look. Door slides with one finger! No messy track to clean. Everyone loves the look! 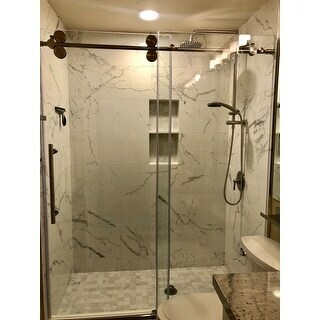 Oh my gosh, what a beautiful high quality shower door! I bought two for my new built home. Thick glass and sturdy hardware. Rolls smoothly. They arrived FedEx freight in perfect condition. I did have one of them have trouble with a clacking sound in the roller. I called VIGO who immediately diagnosed the problem and sent a replacement part which I installed easily. My contractor installed the doors in both baths and said the installation was not the easiest but had no problem with the directions, just with the heaviness of the doors. Two set of hand are definitely needed. I looked everywhere for shower doors and couldn't touch the quality of this door for the price on Overstock any where. Highly recommend! 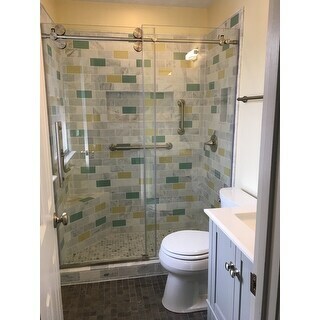 I purchased this door for a bathroom remodel, replacing a "prefab" tub with a tiled shower. Delivery was prompt. Would suggest professional installation. The door can be installed to open either from the left or right, and has plenty of room to adjust to the correct opening width. Very pleased. This is a high quality shower door. I wanted a frameless style with a sliding door. I would recommend a professional installer because they use different install techniques than what is described in the instructions. The only thing missing from this door is a baked on finish to prevent water marks. The installer told me to apply rainx. I also like that this door does not have the overly large rollers. It provides for more of a transitional appearance rather than too modern. The final result is a beautiful addition to the bathroom. Product is heavy and glass thickness and hardware are of good quality. The plastic guard to keep water from leaking is a little unattractive but overall I am very pleased with the doors. I had them professionally installed. Oh my, we were so excited waiting for this shower door!! Believe me, my expectation was up. We had remodeled our bathroom with a shower only, so the shower doors were the final product. But nothing can prepare you for when you see the final product installed. My handy husband was able to begin the install while I was at work. When I came home--tada!! The door opens and closes so quietly, it glides!! I enjoy it each time I walk into the bathroom. Simply thrilled!! A beautiful door, but absolutely terrible installation instructions. We had actually given up and went to a local big box store to look for a replacement. They had a similar door on display and we were able to figure out how to install this. The mechanisms that hold the VERY heavy door up weaken with time. We've had the door for 3 years now and have had to take it down and adjust it twice (about once a year). I don't have high hopes that this will last a long time. I'm worried I'll come home one day to a shattered door because it fell. It's an issue with the round rollers that hold the door. They kind of separate and angle over time. This was a great price, more than half off with free shipping. The box weighted over 250 pounds. 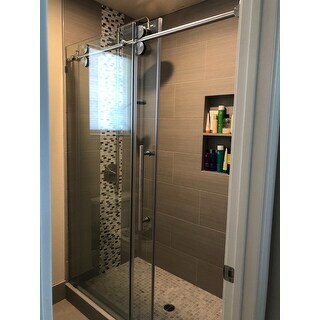 I had looked at this shower door at local vendors and knew the prices, etc so when I saw it on Overstock I jumped at it. They said delivery one to 6 weeks. I had it in 5 days. Great service. If you know what you are looking for and know your prices Overstock is the best place to shop.. The shower doors arrived quickly and in perfect condition. They are heavy, free of defect and have a very industrial/modern look. The silicone flaps between the doors are inconspicuous and do an excellent job of minimizing splash. These are made beautifully and I would not hesitate to buy them again if needed. We did research and saw this door on another site where and we were going to purchase it when I said lets look to see if there is a better price. On Overstock not only was the price $100 less but shipping was free and we got $130 of club O credit. A win win. We installed it ourselves and had minor difficulties; followed all instructions but had to rehang it and make a minor adjustment. I love, love. love these doors even though when I ordered I was worried about the thickness of the glass as it was less than some that I was considering it is perfect and thicker glass would not be needed or wanted just costs more money. They look exactly as shown and they were the finishing touch on my new bathroom. High quality door and hardware. Easy to install. In a guest bathroom and everyone loves it. Beautiful! Good quality. Receive many compliments. Doors glide smoothly. These are the only shower doors I would ever recommend. VIGO is an amazing product & you will get the best prices on Overstock, especially with their coupons. The glass & hardware is as high end as it gets. It will make your bathroom! 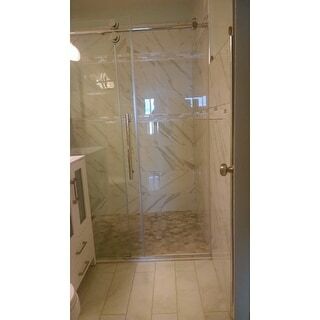 This shower door elevated my bathroom upgrade from beautiful to stunningly gorgeous. Highly recommend. Very heavy hardware built to last. Impressive workmanship. The barn door style glass shower door has been admired by everyone that tours my new master bath. They are beautiful and add a professional touch to my renovation that I was able to install myself with the help of another person. I'm very happy with this purchase. Purchased 2 of those for my walk-in shower which converted from bathtubs. They are very well made, thick glass panels, heavy solid steinless hardwares. The sliding design saves lots of space, which is perfect for smaller bathrooms. Overstock offers good price and delivery service, saved me hundreds of $ from buying from a local glass store. The only thing was I got to find someone to do the installation. This is my third Vigo door that I bought from overstock. Arrived as scheduled, packaged very well. All parts present. Installed in less than 2 hours. I keep buying these particular door, as it does not rust, plastic parts don’t chip or crack. Some yellowing after 8 years on the first door. Rollers are smooth and the door has soft stoppers. Reliable product. This was a great buy. It was kind of difficult to find someone to install it but it is very well made and slides effortlessly. It feels completely solid. I can't speak to the install difficulty but the professional I hired didn't have any problems. "I need the doors to cover a space of 82" then wide: 82" and height 72". Could you please, confirm if you have that measure and the price? Best Regards Victor ****"
"Is the door reversible to open from the left?" "What is the thickness of the glass? 5/16 or 3/8?" The thickness of the glass is 3/8. "What are the ball bearings in the rollers made of? I would like to know there is no plastic in them. Thank you." The rollers have an elliptical mechanism built in to make adjustments on the roller. There are no ball bearings in our rollers. This item comes with a Limited Lifetime warranty. "My opening on a standby up shower is 49' can this fix or do you have any thing on that style that can fit." "Does this door allow for walls out of plumb by 1/2 inch?" How to Clean Bathroom Shower Doors from Overstock.com. Our guides provide customers with information about how to clean bathroom shower doors.